Crazed, trademark eyes often accented by a severe hairdo parted wildly down the middle? Why, we must be talking about Tod Slaughter, of course! The king of the Victorian horrordrama, Tod Slaughter was born Norman Carter Slaughter on March 19, 1885 in England. After his initial debut in theatre at the age of 20 - followed by a stint in the Royal Flying Corps during World War I - the early thirtysomething Slaughter then set about a successful stage career in acting and theatre management. 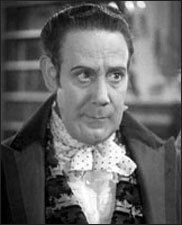 He was adept at playing lead roles throughout the 1920s and early 1930s, including portraying Sherlock Holmes, as well as the protagonist in Alexandre Dumas' The Three Musketeers. But it was his depiction of real life corpse thief William Hare in 1931 that gave Slaughter his first taste of in-your-face stardom. He followed that up by depicting the razor-happy barber in Sweeney Todd: The Demon Barber of Fleet Street, a signature role that Slaughter easily made his own, and which would guide his career in bloody melodramas over the next two decades. About to turn 50, Slaughter made his motion picture debut in Murder in the Red Barn (1935), playing the murderous Squire William Corder...who kills a young maiden named Maria and then buries her body beneath a wooden barn floor. Moviegoers were delighted at Tod's over-the-top bravura as the evil, maniacal Squire in Red Barn. So it seemed natural that the actor would commit to celluloid next his most infamous stage role to date, that of the vengeful-hairdresser-with-a-chip-on-his-shoulder in Sweeney Todd: The Demon Barber of Fleet Street (1936), produced and directed by George King. Slaughter's flair for the melodramatic proved a perfect match for the 19th century penny dreadful source material. Based on the 1847 play written by George Dibdin-Pitt, the film recounts the story of a psychotic barber who lures wealthy patrons into his shaving establishment, where he slits their throats with a straight razor! But the bloody madness doesn't stop there. Sweeney's dubious partner-in-crime, the colorful Mrs. Lovett, then chops the corpses up and uses the human flesh as meat for her pastry pie business. Mmm-mm, good! Slaughter would go on to work with Sweeney Todd producer/director King on a number of cinematic horror/thrillers which would showcase the former's trademark villainy (not to mention penchant for scenery-chewing), including The Ticket of Leave Man (1938), The Face at the Window (1939), and Crimes at the Dark House (1940) among others. In Face, he gets to rob and terrorize the city of Paris (aided by his hideous, crazed brother known as "the Wolf"), while in Dark House, El Slaughter brutally murders a wealthy aristocrat and assumes his identity in order to live the good life...or does he? There was a break in work while World War II raged on. But the resilient Brit picked up the mantel again with Strangler's Morgue in 1946 (also known as The Curse of the Wraydons). This time, he played a vengeful espionage chief who dispatches his family members one by one, framing his innocent nephew for the crimes! Tod Slaughter continued to work throughout the late 1940s and early 1950s, most memorably in Horror Maniacs (1948) and Murder at Scotland Yard (1952), before his death of heart disease in 1956 just prior to his 71st birthday.